Temperatures in the 40s and brisk winds made for challenging race conditions for the more than 35,000 participants in the May 8 OneAmerica 500 Festival Mini-Marathon and its accompanying Finish Line 500 Festival 5K in Indianapolis. But for 178 of those walkers and runners, the cold climate did not cool the warmth in their hearts as they prayed for an increased awareness that God has a vocation for everyone while they wound their way through the streets of Indianapolis and the 2.5 miles of the Indianapolis Motor Speedway. These members of the third annual Race for Vocations team included married couples, entire families, single men and women, religious and priests. They came from across the Archdiocese of Indianapolis, and the Evansville and Lafayette dioceses. 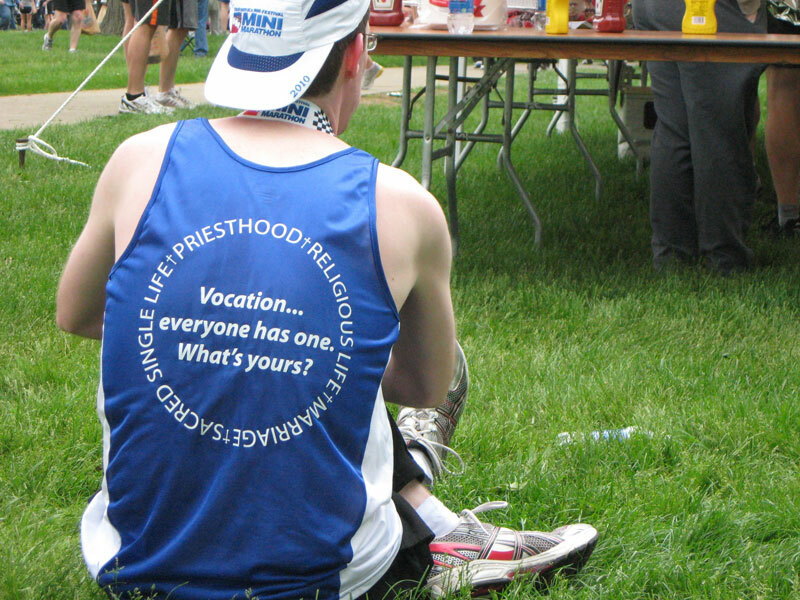 They all wore blue T-shirts or jerseys that listed the kinds of vocations to which God calls people—marriage, sacred single life, the priesthood and religious life. During his homily at a Mass for Vocations celebrated at St. John the Evangelist Church in Indianapolis the night before the Mini-Marathon and 5K, Msgr. Joseph F. Schaedel, vicar general, speculated that the words on the team’s shirts might challenge other people walking and running alongside them. “A race is what it’s all about,” he said on May 7. “Running is the key. 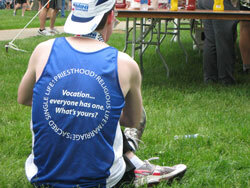 A run for vocations is our way to promote vocations. Father Rick Nagel, who began the Race for Vocations team and continues to organize it, spoke during the pasta supper after the Mass about the happy witnesses to vocations that make up this year’s team. Father Joshua Janko, associate pastor of St. Alphonsus Liguori Parish in Zionsville, Ind., in the Lafayette Diocese, was one of the runners that led the rest of the Race for Vocations team in the Mini-Marathon. He finished the 13.1-mile race course in 1 hour and 31 minutes, the third-fastest time among Race for Vocations’ team members. Although satisfied with his time considering the physical shape he is in, Father Janko has finished much higher in the past. He ran the Mini-Marathon in 1 hour and 11 minutes—and finished 21st overall—in 1997 while a member of the track and field team at Anderson University in Anderson. But running for a higher cause is more important to him now. Although he was focused on running his race well during the Mini-Marathon, Father Janko kept ministering as a priest. There were a few occasions where he would see a runner who had to stop and was being attended to by a race volunteer. As he ran by them, he would give them a blessing while making a sign of the cross in their direction. “One guy I gave a blessing to came up to me not too long later and said, ‘Father, thanks for the blessing,’ ” Father Janko said. Father Janko’s own race for vocations doesn’t end with the Mini-Marathon. Earlier this year, he won a lottery to be a participant in the ING New York City Marathon on Nov. 7. He is planning to wear his Race for Vocations T-shirt during that event. Sebastian and Angela Moster, members of St. Louis Parish in Batesville, finished the Mini-Marathon about eight minutes behind Father Janko. That made Angela, according to The Indianapolis Star, one of the top women finishers from Indiana. But, like Father Janko, the finishing time was not a top priority for Angela. The Mosters, both 36, are the parents of four children ranging in age from 11 to 4. Angela has been on the Race for Vocations team all three years. This year was the first time, however, that she ran the race with Sebastian. He, too, appreciated being a witness to the vocation of marriage by running alongside his wife. Angela and Sebastian’s 11-year-old son, Caleb, spoke of his pride for his parents the night before the Mini-Marathon as he and his family participated in a pasta supper with other Race for Vocations team members in a tent next to St. John Church. While Angela and Sebastian left their four children in the care of grandparents while they ran the Mini-Marathon, the seven people who make up the Kramer family, members of Nativity of Our Lord Jesus Christ Parish in Indianapolis, had a leisurely walk together in the 5K. Ron and Mary Kramer participated with their children, Max, 22, Ted, 20, Kate, 17, and identical twins, Kim and Karen, 8. After the 5K, Mary spoke about walking the 3.1 miles with her family. “It was just really neat for us to have all the kids with us,” she said. “It was a really joyful experience. I would like to do it again, I think. Kim was also happy to walk with her parents and brothers and sisters. “It was amazing and really cool,” Kim said. “I was really happy [to be with my family]. Ron and Mary Kramer set a good example for their children by witnessing for vocations during the 5K. Father Joseph Moriarty hoped to do the same in his training for and running in the Mini-Marathon for the future priests that he helps to form as the associate director of spiritual formation at Saint Meinrad Seminary and School of Theology in St. Meinrad. “As a Christian, I think that one has a holistic outlook,” said Father Moriarty. “To me, holiness is wholeness. And part of that wholeness is a regular physical regimen. Father Moriarty, who is also the sacramental minister of Our Lady of the Springs Parish in French Lick and Our Lord Jesus Christ the King Parish in Paoli, has run in the Mini-Marathon every year since 1994. “There is a spiritual sense to it, even though it’s a secular event, of the unity of people coming together for one cause,” he said. “When you go up by the zoo and there’s kind of an incline and you see thousands of people snaking their way running, I get very spiritually charged by that. We’re together in this task. Father Moriarty finished this year’s race in 2 hours and 14 minutes.